This tour will take you to “the cradle of Tibetan Civilization” Tsedang to discover the mystery of Tibetan Buddhist in Tibet’s most revered Palaces and Monasteries. Sightseeing includes: Yumbulakang (Tibet's first palace), Samye Monastery (Tibet's first monastery), and Trundruk monastery (It has a long history, and boasts many sculptures and paintings from ancient times). In Trundruk monastery, you will see a stunning Tangkha of Pearls decorated with a total of 29,026 pearls. After breakfast, proceed for full day sightseeing of Sera Monastery, Jokhang Monastery, Barkhor Market. 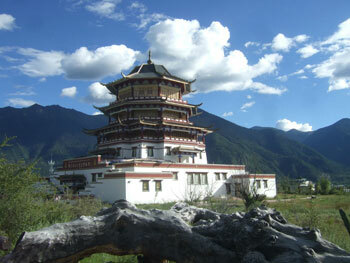 Sera Monastery, 5 Kms north of Lhasa, Sera setting is one of Lhasa's prettiest monasteries. Once a community of more than 5,000 monks resided here and was virtually extinguished by the Chinese. Jokhang Temple, situated in the heart of Old Lhasa, it houses Tibet's most precious religious relic, a golden Shakyamuni Buddha which was brought as a gift by the Chinese Princess Wen Cheng on the occasion of her wedding to the Tibetan King, Songtsen Gompo. Barkhor Market place, which is the religious and social focus of Lhasa. After Sightseeing you will be transferred to hotel for your overnight stay.